Guess what? Storytime finally starts up again next week! We take the summer off to concentrate on summer reading and collection management. So, preschool storytime prep is fully underway this week! For this post, then, I thought I'd just show some of the themes I'm planning for this semester, and the fantastic new and favorite books I'll be using for each. Maybe it'll get your brain going for some ideas of your own! Turns out, there's a lot of picture books about underwear. I guess I shouldn't be surprised, since it's a big step for kids at that age, but there's been some great recent releases, too. Polar Bear's Underwear and Vegetables in Underwear are pretty much just silly stories (which I love), and then One Big Pair of Underwear is a hilarious lesson on sharing, in rhyme. The ever popular How to Babysit a Grandpa and 2015 Caldecott Honor—Nana in the City—will be the stars at my storytime honoring grandparents (Grandparents Day is Sept. 13th). Then I'll also try out the newest Llama Llama book (even though it's not even out yet, I'm assuming it's good!). This will be a first for me: I'm trying out my first wordless picture book in storytime. Float is just so beautiful, I can't help but share it in all its wordless glory. In case it fails, I have my favorite fallback—Elephant & Piggie. Blue on Blue has been used before, but since it's a local author, it's fun to bring it out again. If You Plant a Seed may or may not be my favorite picture book release this year. 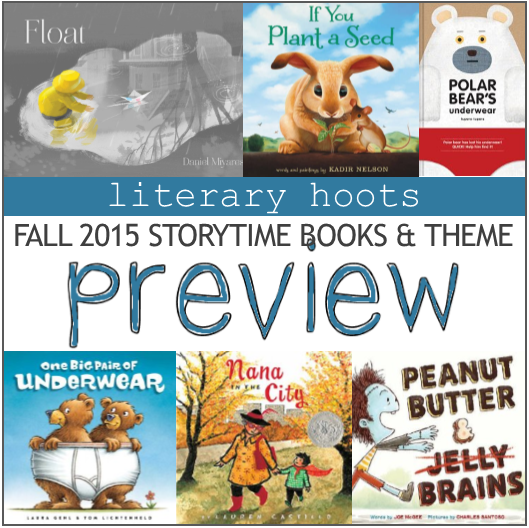 It's a bit of a stretch, but I'm using the harvest theme to loosely fit my Autumn storytime. Also, how could I not use more of the letter "A" with Apple Farmer Annie? And then My Autumn Book is brand new, but the rhyming text seems like it will make for a fun readaloud. Halloween or not, I think I'd do a zombie storytime either way—the books are too cute and fun! (Who knew I'd ever say that about zombies?) Peanut Butter & Brains is the newest release here and it's the biggest reason I'm doing the storytime—so funny, I think the kids will love it. So who else is excited for more storytime?? I'm hoping these new themes are successes!